At Euroclad Windows and Doors, we’re a custom window and door manufacturer, and we often get asked what the difference is between a standard door, and a custom door. Generally speaking, a standard door is a mass produced, off-the-shelf solution. A standard door is very generic, and unless your house is completely generic in door sizing, and taste, you may not get the look and style you want. 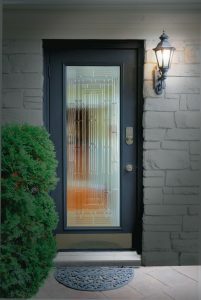 We door offer standard doors, with minimal customization, but where we really shine is when you need to get a little bit outside the standard look. A custom door is completely made to order. With a few exceptions, you get to pick your style, size, material, colour and hardware – and you’ll get exactly what you’re looking for. However, most people don’t know where to start. Those that do, love the products we build. So what is the process for ordering a custom door? How you’ll be using the door will matter significantly when it comes to the types of material, sizing, and hardware that we would recommend. For example, a front door will likely get used much more heavily than an interior bedroom door. A patio door will also likely be larger, and use more glass, than a front door. One is more for privacy, while the other is designed to be more inclusive. Knowing what the door will be used for will go a long way in determining the rest of the factors. The best part about going custom is that you can get a door in a variety of sizes. If you’ve created a grand entryway, a standard size door may be too small to do it justice, and really take away from the space. On the other hand, the last thing you want is to have a door that’s way too large and dominates your front entryway. It will always look a little off, and never seem to fit in. We’ll help you find the right size that will work the best. 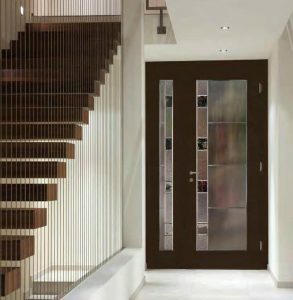 We’ve written many articles about the different materials used in doors, including fibreglass, metal, glass, and wood. Some require more maintenance than others, and there is a price difference between each material. We’ll weight the pros and cons for you and help you decide which material will work best for you, but especially for the application of the door. We’ve built many custom doors for many types of homes. Our team can help you determine if the natural wood look with just the right amount of stain is perfect, or a colour coated fibreglass door will look best with your style home. Colour options today are as unlimited as your imagination. The hardware is the most important aspect of a custom door. The type of door hardware you choose can really determine the style. In fact, two doors that are the exact same in material and colour can look entirely different with modern or classic hardware. With hundreds of door hardware options, we can really bring your custom door to life and make it work for you. Lastly, a custom door may have a larger opening, a custom archway, or tracks for a sliding glass system. We’ve installed thousands of doors, and we’ll be able to tackle the whole project with minimal hiccups. It’s not likely we’ll see something we haven’t seen before. If you’re considering a new door, a custom door can really make things pop, and they’re a lot easier to order than you think. Drop by our showroom to see some options, and our staff can walk you through all the possibilities! Can You Repair A Fiberglass Door?